1. ALEXANDER1 HAY was born Abt. 1638. He married ELSPET BROWN 26 Oct 1658 in Kirkden Parish, County Angus, Scotland. 2. i. GEORGE2 HAY, b. 23 Apr 1669, Montrose Parish, County Angus, Scotland. 2. GEORGE2 HAY (ALEXANDER1) was born 23 Apr 1669 in Montrose Parish, County Angus, Scotland. He married HELEN PETRIE 30 May 1685 in Arbroath Parish, County Angus, Scotland. She was born in Angus, Scotland. 3. i. JOHN3 HAY, b. 17 Sep 1692, Glammis Parish, County Angus, Scotland; d. 1764, Pitt Co. North Carolina. 3. JOHN3 HAY (GEORGE2, ALEXANDER1) was born 17 Sep 1692 in Glammis Parish, County Angus, Scotland, and died 1764 in Pitt Co. North Carolina. He married MARY STAFFORD Abt. 1735 in Beaufort, North Carolina. John Hay was a Jacobite. He was captured at the battle of Preston with 630 other Scots. He was transported on the "Friendship" Captained by Michael Mankin from Liverpool to Port Tobacco Maryland and arrived May 24. 1716. He was sold as an indentured servant to William Holmes Aug 24, 1716. William Holmes apparently had a plantation in Prince Georges Co. Maryland. CLICK HERE TO GO DIRECTLY TO THE JACOBITE PRISONERS PAGE. 4. i. JOHN JR.4 HAYS, b. Abt. 1735, prob. Pitt Co. North Carolina; d. Montgomery Co. Va. or Floyd Co., KY (see notes). 4. JOHN JR.4 HAYS (JOHN3 HAY, GEORGE2, ALEXANDER1) was born Abt. 1735 in prob. Pitt Co. North Carolina, and died in Montgomery Co. Va. or Floyd Co., KY (see notes). 5. i. JOHN III.5 HAYS, b. 1774, North Carolina; d. Abt. Oct 1865, Floyd Co., Ky..
5. JOHN III.5 HAYS (JOHN JR.4, JOHN3 HAY, GEORGE2, ALEXANDER1)1 was born 1774 in North Carolina, and died Abt. Oct 1865 in Floyd Co., Ky.. He married ELIZABETH ANDERSON 10 Mar 1815 in Floyd County, Kentucky2. She was born Abt. 1785 in Carolina, and died Aft. 1880 in Floyd Co., Ky,. 6. i. ANDERSON (CAPT. )6 HAYS, b. 22 Apr 1821, Lackey, Ky; d. 24 Dec 1909.
ii. JOHN HAYS, b. 1816; m. MAHAILA MARTIN, 18 Jan 1838, Perry County, KY.
iii. DANIEL HAYS, b. 1818; m. POLLY SIZEMORE; b. 1821.
iv. SEATTIE HAYS, b. Nov 1817; m. (1) JOHN C. SUTTON, 18 Jan 1832; b. 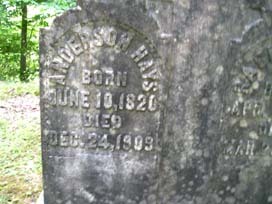 17 Aug 1806, Tn; d. Floyd County, KY; m. (2) JAMES GRIFFITH, 05 Aug 1852, Floyd County, KY; b. Feb 1827.
v. NELSON HAYS, b. 1826.
vi. ELIZABETH HAYS, b. 1827; m. JESSE WICKER. vii. DAVID HAYS, b. 1828; m. ELIZABETH HICKS. 6. ANDERSON (CAPT. 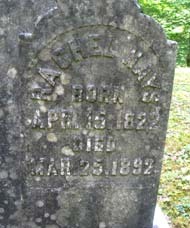 )6 HAYS (JOHN III.5, JOHN JR.4, JOHN3 HAY, GEORGE2, ALEXANDER1) was born 22 Apr 1821 in Lackey, Ky, and died 24 Dec 1909. He married RACHEL SIZEMORE 1842, daughter of GEORGE SIZEMORE and ALETHA RICHARDSON. She was born 15 Apr 1822, and died 25 Mar 1892. 7. i. JOHN WESLEY7 HAYS, b. 29 Jan 1855, Lackey, Kentucky; d. 03 Mar 1936, Hindman, Kentucky. 7. JOHN WESLEY7 HAYS (ANDERSON (CAPT. )6, JOHN III.5, JOHN JR.4, JOHN3 HAY, GEORGE2, ALEXANDER1) was born 29 Jan 1855 in Lackey, Kentucky, and died 03 Mar 1936 in Hindman, Kentucky. He married LUTITIA PERKINS 12 Mar 1877 in at Alvis Draughn's home, daughter of ELIJAH PERKINS and MARY DRAUGHN. She was born 19 Dec 1858 in Grayson County, Virginia, and died 21 Nov 1939 in Hindman, Kentucky. 8. i. HATTIE CORSICANA8 HAYS, b. 04 Nov 1884, Ivis, Kentucky; d. 25 Sep 1967, Homeplace hospital, Kentucky. 9. iv. AUGUSTUS ARNET (GUSS) HAYS, b. 28 Dec 1881; d. 09 May 1965. 10. vi. NONNIE HAYS, b. 30 May 1890; d. 02 Aug 1966. 8. HATTIE CORSICANA8 HAYS (JOHN WESLEY7, ANDERSON (CAPT. )6, JOHN III.5, JOHN JR.4, JOHN3 HAY, GEORGE2, ALEXANDER1) was born 04 Nov 1884 in Ivis, Kentucky, and died 25 Sep 1967 in Homeplace hospital, Kentucky. She married CURTIS PIGMAN 16 Feb 1905 in Knott County Kentucky, son of JOSEPH PIGMAN and MARY SMITH. He was born 09 Jan 1880 in Letcher County (Smith Branch) Kentucky, and died 30 Nov 1954 in Lexington, Kentucky. 9. AUGUSTUS ARNET (GUSS)8 HAYS (JOHN WESLEY7, ANDERSON (CAPT. )6, JOHN III.5, JOHN JR.4, JOHN3 HAY, GEORGE2, ALEXANDER1) was born 28 Dec 1881, and died 09 May 1965. He married OLLIE PIGMAN, daughter of JOSEPH PIGMAN and SARAH JONES. She was born 21 Nov 1890, and died 21 Aug 1967. 10. NONNIE8 HAYS (JOHN WESLEY7, ANDERSON (CAPT. )6, JOHN III.5, JOHN JR.4, JOHN3 HAY, GEORGE2, ALEXANDER1) was born 30 May 1890, and died 02 Aug 1966. She married RUDOLPHUS (DOLPH) PIGMAN, son of JOSEPH PIGMAN and SARAH JONES. He was born 30 Nov 1884, and died 21 Oct 1910. 1. 1850 Floyd County KY Census. 2. Marriage perfomred by R. Haws, Justice of the Peace.